I think I could do Labor Day. If we think the race might be too long, we could always make a certain cutoff, like "First to beat Agahnim" or something. Not sure I can commit to a day/time, sorry. Sounds like fun, sadly I will be out of town all weekend. [QUOTE="Daos, post: 1607075, member: 24674"]Sounds like fun, sadly I will be out of town all weekend. Yeah, at least I think the damage model difference between the normal sword and the master actually only affects Light world enemies. The hammer and fire rod are both much, much more powerful than the normal sword, and it's fairly likely you might pick up at least one of those early on. Fire rod can kill the Lanmolas in 2 hits, apparently. **** was so cash. Last item in the game. Truly all my life's achievements have led me solely to this moment. Fatefully-timed internet problems have struck my main rig, so I'll have to sit things out tomorrow. [QUOTE="Marilink, post: 1607242, member: 23215"]Ganon's Tower. The ultimate catch of the day. Finally got around to giving this a try, and it's been a lot of fun. My rom's been an interesting one. got the magic mirror instead of the lantern right off that bat, bombs instead of the boomerang, picked up the lantern in town instead of a bottle, got the moon pearl, hammer, cape, and quake medallion shortly there after. Then the shovel and blue mail. Feeling pretty OP all and all. But... I couldn't find the book of mudora, power glove, bow, or flippers. so I was basically stuck. All that progress and I couldn't even make it into two of the lightworld dungeons. Can't even beat the first one without the bow. So I jumped straight to Agahnim. Took him down and because I already had the magic mirror, hammer, and moon pearl I had a large chunk of the darkworld already open to me. Explored the first palace and found the flute and flippers. Jackpot. I had honestly been starting to worry about getting stuck. So I decide to check out the lake next and what do I see sitting on that island where the piece of heart usually is? The bow! You know, I never realized how many rooms you need the bow to make it past. There's a lot of enemies that are immune to everything else and they're always in rooms with life-locks on the doors. Found the cane of Somaria in the digging game, and the powerglove in a random darkworld cave. Used the flying duck to skip to the top of death mountain and clear out the place but didn't find anything too significant aside from a bunch of heart pieces. Turned out the bug catching kid had the pegasus boots the whole time. I'd forgotten you have to speak to him with a bottle and was wondering why he wouldn't give me his item earlier. Found the titan mitt and fire rod in another random dark world cave. Rescued the blacksmith and got the level 3 sword without ever getting the Master sword. Don't see any reason to now. The book of mudora finally turned up in the misery mire entrance. Next I'm looking at going after the desert. ^This post makes me wish I had kept track of my progress while playing. That was fun to read! Nah it's cool man, I understand. 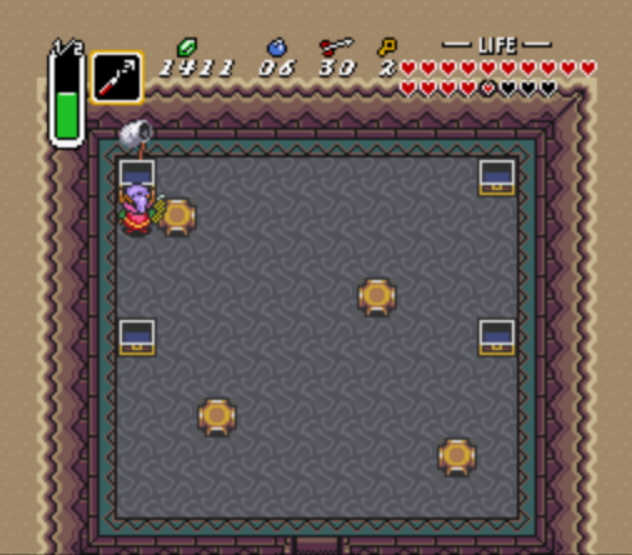 So starting off I went into the swamp palace with my flippers and found the bombos medallion before hitting a dead end. This is good because the misery mire required it to get into the main dungeon. Went to explore the the skull woods next and found the hookshot in the fire rod's big chest. That was the last of the major roadblocks and I felt a sense of relief since it I definitely had the tools to beat the game. Blind's hideout finally gave me the boomerang, but I'd already found the magic boomerang in the kakariko village near the begining of the game. Nothing of note in the ice palace and misery mire. Interesting to see the level 4 sword and silver arrows were still in the same place. I guess that would have been hard to change. Found the ice rod in the treasure cave under the rock on the dark world's death mountain. I'd been wondering when it would turn up. Turtle rock ALSO required the bombos to get into. Must be revenge on the ether and quake for stealing the more useful roles. Turtle rock happened to have the last bottle in it. The key layout was strange, I ended up with 2 extra keys at the end somehow. Ganon must have been hoarding items because I found the red mail, ether, magic powder, staff of byrna, and the last 3 pieces of heart there. It's funny, but out of all those items I missed the magic powder the most? It's ability to turn the anti-faries into regular faries makes the game soooo much easier. An invincible, magic draining enemy becomes a free health refill. And without the powder I couldn't get my magic doubled. I was genuinely worried about running out in turtle rock (but it wasn't that bad). I did have trouble with running out in the g-man's towers with all those torch lighting puzzles. The fire rod is a magic guzzler. Speaking of which, I was surprised when the bat gave me 4x magic instead of just 2x. Apparently that's a thing that can happen? I was honestly surprised I found every heart piece. It's been over a decade since I last played through the game and I just figured I'd have forgotten some little side chest or something along the way? All and all, I really enjoyed this and it's reminded me of just how much more weird junk there was in LttP than newer games. They hid actually useful items EVERYWHERE to make it fun to explore and it's hard to tell where the secrets are going to be cause the game is just filled with weird red herrings. Lots of arrows in the grass and bushed that may or may not point to something. Oddities like the octoballoon enemy or that little almost but not quite dried up pond over by the eastern palace? Random stone statues in interesting configurations? The desert octopus? This is something modern Zelda games are lacking. First time playing you'd be attracted to spots like that with no real way of knowing if they meant anything and they fit in perfectly with the other actual secrets without really feeling artificial and while also not being disappointing if they don't "do" something. They give a sense that there's more to the game world than you'll ever really get to know or see, while most of the newer games just kinda feel "done" once you've found everything. The very fact that it's even possible to reshuffle the items like this and have any chance of the game coming out not only playable but also not losing much coherency in the process is something that makes it stand out on it's own. Like, I know the program guards against unwinnable scenarios, but something like this couldn't be done in other games to anywhere near the extent. Btw, I never got the Master sword, so during the ending scenes the lost woods was still all foggy. As it should be. ^I also never got the Master Sword--ended up just skipping straight to L3 like you did. My ROM was pretty punishing, because most of the items to progress through Light World Dungeons were about halfway through Dark World Dungeons, so the first half of my entire playthrough was me scouring the world for the Moon Pearl and Mirror. Once I got those, though, the game really opened up for me. I also got the Cape before I got the bow, lantern, or Fire Rod, so I was really forced to the Dark World early. But then I had to go back to the Light Word dungeons anyway to get a couple of important items like the Ice Rod and the Cane of Somaria. I also didn't get the flute until way late, so much of my traveling in the world was made up of Save/Quitting and just straight up running. This was good, though, because it re-familiarized me with the world and I was able to explore a lot more knowledgably, which will help for later runs if I do this again. I ended up missing 3 pieces of heart, and I'm scared of future runs because something important might be hidden where they are--and I don't recall their locations. I'm hoping they were just in unexplored dungeon areas. Oh, also, I was really hampered by not having the lantern until very late. I didn't feel like doing dark rooms without it, especially in Turtle Rock. I finally found it in a Dark World cave by level 2 that I had just forgotten about. Wish I had checked there sooner, because I essentially had to do the Eastern Palace, Misery Mire, and Turtle Rock twice each. I'm so happy I played this, though. It made the game feel super fresh, even while seriously testing my well-established knowledge of the game. I'll echo what AI said--"I could really use this." I'm not sure how to express that sentence in the past tense, but I think you get what I mean. That's cool sounds like they made you work for it. I was actually really relieved the moon pearl and mirror showed up early cause I DID NOT want to deal with going to the dark world in rabbit form. So much for the whole"only the master sword can defeat Agahnim" story, eh? A little part of me was kinda disappointed it made absolutely no difference. [QUOTE="Cravdraa, post: 1607290, member: 21510"]That's cool sounds like they made you work for it. Thankfully, saving and quitting will always bring you back into the Light World, so it's impossible to get soft locked as a rabbit in the Dark World. I did see a picture of someone who found the Moon Pearl right on the Pyramid, though, so that's a potential scenario. In my current run, having decided to forego the master sword despite collecting the pendants twice (they just won't stay collected), I moved on. I don't have the lantern but DO have the fire rod, so I haven't been able to do the dark parts of the Dark Palace. I really do hope it's not going to be stuck in there somewhere. So I moved on to the Swamp Palace. It's not exactly a piece of cake when you don't have a bug net and have no bottles, so I was very happy to find the blue mail in the second half of the dungeon! It turns out that some of the code is still specific to having the Master sword, though. The boss of the dungeon could not be harmed with the normal sword. Instead, I tested out some other items. The hammer made short work of him, luckily enough. I simply hadn't gotten around to it yet, but after that I trouped off to get the Lvl 3 sword right away. Wouldn't want to run into someone I actually can't hurt. That just wouldn't do. ^My experience, though it's empirical, tells me that they won't hide the lantern in an area that's only accessible through darkness.